The viewing is from 5-7pm Sunday November 29th with the rosary at 7pm. There will be a procession on Monday November 30th at 10am a reception for family and friends will follow. All are welcome to attend and celebrate Shadow’s life. The Carrizales family would like to thank everyone for their love, support and prayers. I was invited to attend the delivery of the $8000 check (a Giant Check) to the Dell Childrens Center by the Leander chapter of Gypsy MC. It’s a wonderful story which i will simply post here from their email. Photos are included below. Congratulations Leanderthals and Gypsy MC! In late September, the Leander Chapter of Gypsy Motorcycle Club International held its annual run with over 300 in attendance. Over a two day period they raised $8,000 for St. Baldrick’s, a volunteer-powered charity that raises funds for childhood cancer research. On Saturday (today), they will present the St. Baldrick’s check to representatives of the Children’s Blood & Cancer Center at Dell Children’s. Leander is a very active chapter and loves supporting their local community. One of its members has been a longtime supporter and participant of the of the St. Baldrick’s head-shaving events held at Dell Children’s Medical Center. 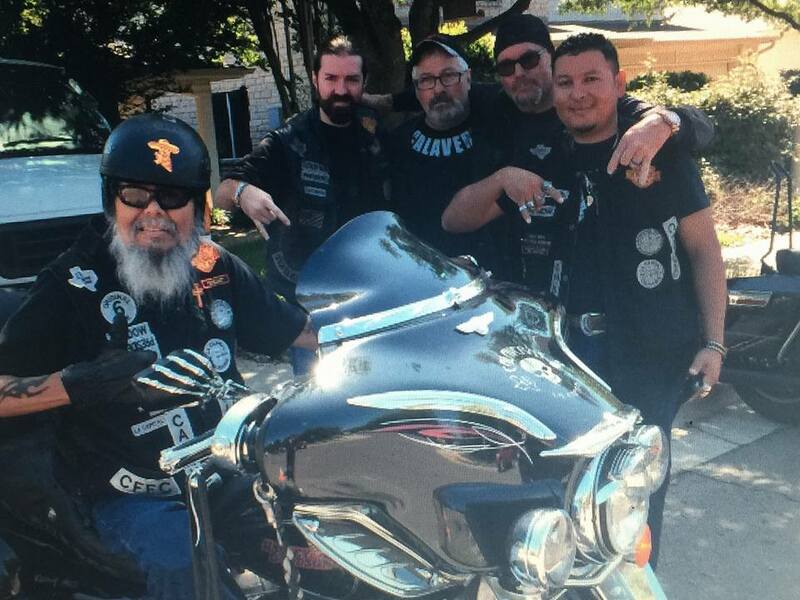 Gypsy Motor Cycle is a family club that supports and promotes the entire family. They are all tied together with a love and passion for riding motorcycles. The organization has been in existence since 1932 and started in Merryvilles, Tennessee. They have chapters in the United States, Mexico and Germany. Well, we had a feature packed meeting this evening, From the introduction of a new club to the group, to event notifications (go to UCOTexas.org for details), to the secretaries meeting to distribute J.W.Rock family details for the Christmas deliveries, it was a good meeting indeed. Oh, and the knife raffle winners were drawn too, raising another $800 for the J.W.Rock Foundation. I consider it a privilege to know each of you. I know some better than others, but on the whole I know you are all good people. You help your friends, and you often help people you don’t even know. In a sense we are all like brothers and sisters. Perhaps not as close as your fellow club brothers, but even so we share a special connection of respect, trust and yes even love. I have heard several of you call me pastor, and so I am, though not ordained. Some of you have been brought up to think of a pastor or priest as someone very special. Someone who has dedicated their life to God, someone who is extra holy. Now I don’t want to mess with your head too much, but you do need to know that there is very little difference between me and you. Like you I make lots of decisions each day. Some good, and some not so good. On my own I often make pretty good decision, usually, but my odds of success are really no different than yours. There is one thing though that I do that improves my chances of success dramatically. You might wonder what that is, and I will tell you, thought it is so simple you may not believe me. You see, the one thing I do that makes a difference is, I listen for that voice in my head that tells me to do something for someone or say something to them that will encourage them. It’s not hard really, and many of you already know what I am talking about. You just have to start sorting out the noise in your head. is it other peoples voices, your own voice, God’s voice or that other guy. Some of you probably think I’m crazy by now, and there are certainly lots of people in mental hospitals that hear voices in their heads, but I challenge you to consider the possibility that every thought you have may not be your own. I should also mention that sorting out those thoughts won’t always be easy. The one standard I use to help me decide who is speaking to me, is the Bible. If the thought is consistent with God’s word, then it must be from God. If it isn’t, then it’s either my thought, or that other guy we don’t talk about. We tend to think our thoughts are our own, and if I think it, it must be true. But if you take a moment to evaluate your thoughts, you might find I am right. It is a great adventure to recognize the voice of God in your head, and to respond to it in the affirmative and then see how God can work through you. I can’t say I do this every day, but when I do, the result is almost always amazing. You see, I am really nothing special, but when I listen to the voice of God and respond. Very special things happen, and I am blessed beyond words. I’m listening, how about you?